^ Rudall, H. A. Beethoven. New York: Sampson Low, Marston & Co. 1903: 71. ^ Matthews, Max Wde. The encyclopedia of Music. 2002: 335. ^ Morris, Edmund. Beethoven: The Universal Composer. HarperCollins. 2005: 93–94. ISBN 0060759747. ^ Thayer, Alexander Wheelock. Elliot, Forbes, 编. Thayer's Life of Beethoven revised. Princeton: Princeton University Press. 1921. p. 291 and p. 297 (1967). ISBN 0-691-02702-1. ^ Ludwig van Beethoven, Sonate für Klavier (cis-Moll) op. 27, 2 (Sonata quasi una fantasia), Cappi, 879. Beethovenhaus. [January 12, 2012]. 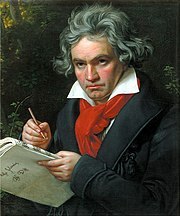 ^ Beethoven, Ludwig van. Beethoven: The Man and the Artist, as Revealed in His Own Words. 1st World Publishing. 2004: 47. ISBN 1595401490. ^ See. e.g., Allgemeiner musikalischer Anzeiger. Vol. 9, No. 11, Tobias Haslinger, Vienna, 1837, p. 41. ^ See, e.g., Ignace Moscheles, ed. The Life of Beethoven. Henry Colburn pub., vol. II, 1841, p. 109. ^ "Moonlight Sonata", from Grove's Dictionary of Music and Musicians. J.A. Fuller Maitland, ed., Macmillan and Co., London, 1900, p. 360. ^ Kennedy, Michael. "Moonlight Sonata", from Oxford Dictionary of Music 2nd edition. Oxford University Press, Oxford, 2006 rev., p. 589. ^ 11.0 11.1 11.2 Beethoven and the Moonlight Sonata - Beethoven Sonata in C sharp minor op. 27 no. 2. ^ Countess Giulietta Guicciardi. （原始内容存档于2009-04-19）. ^ Ltd, Not Panicking. h2g2 - Beethoven's 'Moonlight' Sonata - Edited Entry. ^ Dubal, David. The Art of the Piano. Amadeus Press, 2004, p. 411. ^ See, e.g., Wilkinson, Charles W. Well-known Piano Solos: How to Play Them. Theo. Presser Co., Philadelphia, 1915, p. 31. ^ Swafford, Jan. In Search of Lost Sounds. 2010-03-02 –通过Slate. ^ Charles Rosen. Beethoven's Piano Sonatas: A Short Companion. Yale University Press. 2002. ISBN 0300090706. ^ Banowetz (1985), p. 168.